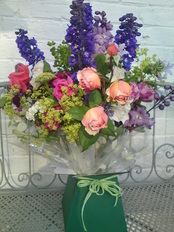 Prestwood Flowers is commited to providing you with beautiful and vibrant locally grown flowers. Our flowers are grown by organic methods at Manor Farm Prestwood in rural Staffordshire, using nothing but what nature intended. No fertilizers, sprays, pesticides or chemicals - just sun, rain and hard work. Uniformity is not our aim - each flower has its own chacter. It's really easy to use, if you want to enter text you just click on any of the icons in the bar above and drag the to the page and then drop them where you want them. I've divided the page into 2 columns for you already as i tend to think this looks better. have a play around with it, it's alot easier than it sounds! !